There are 26 schools with Acute Care Nurse Practitioner MSN programs in our online directory. Acute care is short-term care of injury or illness or other medical condition that is not a chronic ailment. Diseases, injury, illness, and surgery are just several examples of acute care. The Acute Care Nurse Practitioner program is an Advanced Practice Nurse Practitioner program (APRN) that is highly tailored to acute care. Generally speaking, the Acute Care Nurse Practitioner program is a graduate level program (a Master of Science in Nursing), and an RN license or a BSN degree is typically an admissions requirement. There are several online programs available that you may consider. The Acute Care Nurse Practitioner program is an Advanced Practice Nurse Practitioner program (APRN) that is highly tailored to acute care. Generally speaking, the Acute Care Nurse Practitioner program is a graduate level program (a Master of Science in Nursing), and an RN license or a BSN degree is typically an admissions requirement. One of the major subjects within acute care is the immediate intervention for people that are suffering from illnesses that are abrupt, brief, and in need of quick treatment. If you have made the decision to move forward in a degree program such as this one, you may have the opportunity to learn about the different types of illnesses and injuries that are common in acute care centers. Some areas of medical care that you may see acute care nurse practitioners is hospitals, emergency rooms, acute care centers, and mobile emergency services. 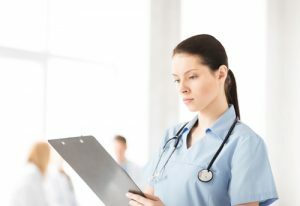 Although it may not seem as if there is a profound difference between what it takes to become a primary care nurse practitioner and an acute care nurse practitioner, both require a unique set of skills that can be obtained through master’s level degree programs. Our team of education experts has been researching college programs for over a decade. They have provided this guide for you so that you can have more information about what is required to become an acute care nurse practitioner and what benefits are associated with this degree program. Read more about this field below. What Exactly is an Acute Care Nurse Practitioner Degree? The Acute Care Nurse Practitioner degree was integrated into higher learning programs due to its usefulness in the medical field. People that have sustained a dangerous illness or injury require immediate care from professionals that have experience dealing with emergency situations. This degree program typically lasts around 3 years for students that have already completed their BSN. This program can be found in both MSN and DNP format, which adds to the luster of these degree programs. In addition to higher degree programs, graduates that have already obtained their MSN in advanced nursing practice may be eligible to enroll in post-master’s certificate programs or DNP programs that can assist them with taking part in this specialization. While enrolled in this degree program, students may likely come in contact with situational case studies and projects that require them to engage in quick thinking and rational decision making. It is important that students are taught how to properly analyze and treat unknown medical conditions in a fast-faced setting, due to the critical nature of this career field. If you believe that you have the skills to take part in this amazing field, degree programs can be found both in-person and online. Online degree programs can provide a more convenient method for getting a career that is meaningful to the people that it serves as well as to the professional. High quality online acute care nurse practitioner programs consist of courses that are reviewed and approved by the Commission on Collegiate Nursing Education (CCNE). One of the most interesting factors related to this degree program is its specializations. Although acute care is a concentration on its own, there are different focuses that you can choose from when enrolling in the program. Acute care that focuses on the care of geriatric patients, pediatric patients, and the general population are common, since these groups can require different care depending on the circumstance. There are also specific certificate programs available to students that wish to focus on the treatment of particular conditions, such as cancer or disease. If you have a group that you would be more interested in working with, choose a topic that is better related to your interests. In terms of courses, the subject matter of course work can be different depending on which track you take for your degree. Some common courses related to these degree programs will be listed below for you to review. As an important topic within acute care, the use of pharmaceuticals for the treatment of acute and serious illnesses and disease may be discussed throughout this course. Students can learn about the differnet medications available for treatment, as well as their uses and side effects. In order to provide optimum care to patients within a health care setting, students must be able to differentiate between the different drug classes in an efficient and fast-paced way. In this course, students can learn how to use properly clinical judgment in the care of infants, children, and adolescents. Throughout the course, students can learn to understand common complex illnesses, injuries, and diseases common in this population in order to provide treatment methods that are accurate and effective. Students taking this course may research the various common ailments associated with normal aging. Critical care for people within this age bracket may also be discussed, which includes a focus on conditions relating to the heart, brain, and circulatory system. Health assessments, analysis, and treatment may also be covered in detail throughout this course. While in this course, students can learn how to properly conduct a useful health assessment on patients from all age groups. Communication methods for working with the public may be a focus within this course, as well as the methods for appropriate health history collection, and medical record review. Students may also be taught how to accurately take physical and mental assessments, alongside generic health screenings for all people. In order to be an effective acute care professional, a student must be able to discern between the different types of acute illnesses and diseases common in society. This course outlines the various types of acute illnesses within all populations, and provides insight into the assessment, diagnosis, and treatment of them. How much does an Acute Care Nurse Practitioner degree cost? If you decide you want to pursue as an acute care nurse practitioner, you have several options for your degree program. From the bachelor’s level, you can start by obtaining a master’s level degree that is relevant to your prospective career. If that is not as far as you want to go, DNP programs are also available for you to enroll in. When found online, these programs can have tuition and fee costs that are extremely different depending on the college you are looking at. Tuition rates can be observed in per-hour, per-semester, or total format. Fees for each university can include those regarding application, technology, online courses, materials, and even graduation. It is vital to take these costs into consideration when choosing the right degree program. Saving money on tuition can be easy through some extra research at a few different colleges. Our team wanted to give you some examples of costs from different college so that you could better understand how much these costs can vary. Take a look at what was found below. The University of Michigan – Acute Care Pediatric Nurse Practitioner Program MSN: This incredible program through the University of Michigan offers students the opportunity to indulge in acute care for the pediatric population. The program is offered in both 2 and 3 year formats, which adds to the flexibility for interested students. Tuition costs for this university are listed as $14,402 per semester for in-state students and $45,410 per year for out-of-state students. The school also states that other expenses related to this degree program can total $2,454 per semester. The University of Illinois – Chicago – Doctor of Nursing Practice – Adult-Gerontology Acute Care Nurse Practitioner Program: The DNP program for acute care nurses at the University of Illinois at Chicago has a competitive curriculum that can assist you with becoming even higher up the ladder in the field of nursing. This degree program has tuition that is charged at a per-credit hour rate of $830 per credit hour. The entire program is 77 credit hours, making the total charge for tuition only $63,910. The University of California – San Francisco – Adult-Gerontology Acute Care Nurse Practitioner Program: The University of California at San Francisco offers students the option of pursuing a MSN AG ACNP through their university. For students that have already achieved a MSN in advanced nursing practice, the university also offers a post-graduate certificate program. Regardless of which path is suitable for your needs, you can rest assured that the education you receive through both programs can help you with becoming certified as an acute care nurse practitioner. Tuition costs for this program come in at $11,502 annually. Fees at this university include those for students services, community centers, graduate and associations, and insurance premiums. There are different areas in which you can exhibit your skills as an acute care nurse practitioner. While the generic form of this degree program is available in large quantities, some people choose to pick a specialty or age range for their program. In order to give you a better understanding of some of the different sectors you can work in, our team has provided some further information below. If you have obtained certification as an acute care nurse practitioner, you can find careers in more specialized fields through certificate programs and further certifications. One of the most popular fields for professionals within this realm is pediatrics, due to having the ability to work alongside children. In this profession, you could work in hospitals, health care centers, or in pediatric health offices. Your service to children in this line of work would be dedicating yourself to assisting in times of emergency, or in times where care is needed for acute illnesses or injuries. Another component of the vulnerable population is those in old age. These people require specialized help during times of sickness or injury. If you choose to work in this field, you may spend time working in hospitals, emergency home services, or even with retirement homes. It is important to have a professional on staff that knows how to react in the event of an emergency in order to keep people within this age group from harm. This field also requires special certifications if the degree program was not specific to gerontology. In addition to working with particular groups of people, you may also find programs that set you on track for working with people that have been diagnosed with different diseases or illnesses. For instance, programs that focus on the care of patients that suffer from cancer is a commonly-found choice at some universities. Working in acute care for cancer patients requires a strong understanding of the different types of cancers and their reactions to the human body. Since cancer can have devastating effects on those diagnosed with it, special practitioners need to be on staff to determine what methods of treatment are needed in the event of an acute illness or injury. What Does An Acute Care Nurse Make? As with most positions in the medical field, the salary and job outlook can be very different depending on the place in which you are employed. The national average for nurse practitioners in the U.S. is $100,910 per year, according to the BLS (BLS; 2016). 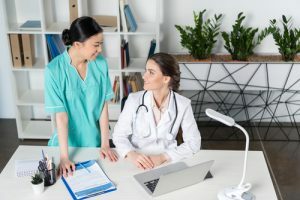 Since the population continues to rise within the United States each year, there seems to be a significant outlook for growth within the field of nursing practice as well. The BLS reports that this field should see a growth of 31% from now until 2014 (BLS; 2016). As a nurse practitioner, the first license you are required to obtain is your nursing license. Since you have to have your license to be accepted into MSN and DNP programs, most nurses have already completed this step prior to even completing a higher degree. Regardless of the type of specialization you choose for your degree program, you will be responsible for obtaining proper certifications after completing your degree. The American Nurses Credentialing Center is the leading source of certification for nurses that have chosen the acute care path. Once you have received proper certification through the application and testing process, you will be released to work freely within your state. Ready to Become An Acute Care Nurse? While there are plenty of specialty fields within nursing, there is no other one that provides immediate, life-saving care to patients that are suffering from acute illness and injury. It takes a very special person to be a part of this field, due to the dedication and hard work that goes into it. If you are currently working as a registered nurse but want more for your career, advancing your degree within this field can be a great option. From day to day, you could see a wide range of patients that are desperate to have adequate and relevant assistant for their conditions. Online degree programs can be the way for you to meet your full potential without having to make any life changing sacrifices. Now is the best time to do your research and find an accredited educational program to enroll. See below for the list of all of the Acute Care Nurse Practitioner programs in our database.